The first week in July is NAIDOC Week here in Australia—a time dedicated to celebrating Aboriginal and Torres Strait Islander history, culture and achievements. This year (2017) the celebrations are entitled Our Languages Matter and they are focussed on the unique and essential role that Indigenous languages play in cultural identity, linking people through story and song to their land, water, history, spirituality and rites. Committee Co-Chair Benjamin Mitchell hopes that the theme will shine a spotlight on the programs and community groups working to preserve, revitalise or record Indigenous languages, and encourage all Australians to notice the use of Indigenous languages in their community. 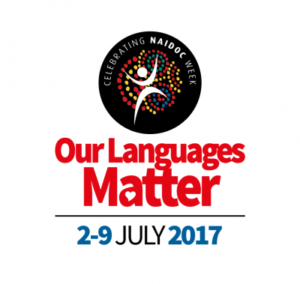 Wherever you live in the world, NAIDOC Week in Australia is a powerful invitation to notice, celebrate and preserve the rich heritage of Indigenous languages of the country you inhabit. Innovative Resources has had the privilege of collaborating with SNAICC in the production of Talking Up Our Strengths, a resource that celebrates the strengths and resilience of Aboriginal and Torres Strait Islander cultures.